Our search engine is simple for our users, but it executes complex queries and analyses different variables, so that you always get the best price on your train tickets Madrid - Alicante. There are different types of journeys Madrid to Alicante, business trips and pleasure trips; therefore, what we look for in each trip is different. From here, we give you the different options to travel from Madrid to Alicante according to your needs. How to buy train tickets Madrid - Alicante at the best price and not die in the attempt? Buy them online on Trenes.com! Trains Alicante with Alvia for only 19,05 €. If you are going to make a business trip Madrid to Alicante, the most common thing is that you want to travel as fast and comfortable as possible. In this case, the option that best fits your needs is to take the AVE train, which is the one that makes the route from Madrid to Alicante faster. You don't need to keep looking, we have the cheapest train tickets Madrid - Alicante. Also for the return, Trains Alicante to Madrid. The AVE travels the 359 Km of distance between Madrid and Alicante in only 2 hours 18 minutes. You can take the AVE at the station of Madrid at 16:25 h and you will arrive at Alicante / Alacant at 18:43 h, its wonderful. The ticket of this type of route has its price in 35,40 €. Also, do not forget that you can relax during the trip enjoying all the comforts of the Preferente class for a price of 110,50 € at most. If we have the opportunity to travel, we do not have to do it in an expensive way, comfort and good prices are included in our train tickets Madrid - Alicante. The train timetables for trains from Madrid to Alicante on Train Timetables Madrid to Alicante. The search for the train ticket from Madrid to Alicante with the cheapest price was made on the 28/03/2019 a las 18:09 h, it is a Alvia train with departure on the 20/04/2019 a las 20:10 h and arrival on the 20/04/2019 a las 23:01 h. The price of the cheapest ticket has been 19,05 € and the cheapest rate with which this price has been possible has been the rate Promo . Trenes.com issues official Tren Madrid Alicante tickets and it does totally legally as a verified and authorised travel agency by Renfe, ie if you buy a Tren Madrid Alicante ticket through our website, you only need to print the ticket or to show the bidi code sent to the mobile phone, present it at the Madrid Atocha station and get on the train you have got assigned. 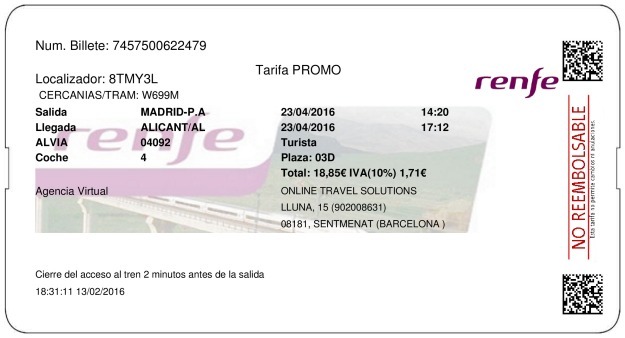 This is a real example of a Madrid Alicante ticket issued by Trenes.com. On it you can see the ticket number 7457500622479, the locator 8TMY3L, the origin and destination stations, in this case the train travels from Madrid Atocha to Alicante / Alacant. The railway operator Renfe, the train type ALVIA, the train number 04092 and the rail car 004. The contracted rate Promo in Turista class, the assigned seat 03D, the price for the ticket, this Madrid Alicante train ticket is not necessarily the cheapest ticket since the price of the train ticket often depends on the time in advance with which you bought the ticket. In this case the price is 18,85€ and the departure date is 23/04/2016. The train departure time of this ticket is at 14:20 h and the arrival of this train at the Alicante / Alacant station is at 17:12 h. The duration of the journey from Madrid Atocha to Alicante / Alacant has been 2 horas 52 minutos. Changing perspective, if what you are going to do is a trip Madrid to Alicante for leisure, we assume that your priorities change and what you prefer is that your ticket Madrid to Alicante is as cheap as possible. We can anticipate that travelling from Madrid to Alicante in the evening and in Turista class, the prices for tickets from Madrid to Alicante are much cheaper. Take sides for the cheapest train seats Madrid - Alicante. In this case you have the option of a cheaper ticket by taking the train that departs from Madrid at 14:20 h and that reaches Alicante / Alacant at 17:15 h. This type of ticket only costs 19,05 €, and you can also enjoy the advantages offered by the Turista class. We have a predilection for offering the cheapest train tickets Madrid - Alicante. As you can see, our train tickets Madrid - Alicante have prices that range from 19,05 € to 110,50 € and that everything depends on the needs you have at the time of purchase and your economy. The point is to offer you what you need when you need it. Therefore, whatever your priority is when travelling by train from Madrid to Alicante, dont hesitate and visit Trenes.com. Whether you have already travelled a lot or you do for the first time, make the most of the advantages of checking our advices so that your train seats Madrid - Alicante cost very little money.